Important Note 2018 : If you are first timer to this garden, Kindly note that people and auto drivers do not know this garden with name ‘Nirvana’. 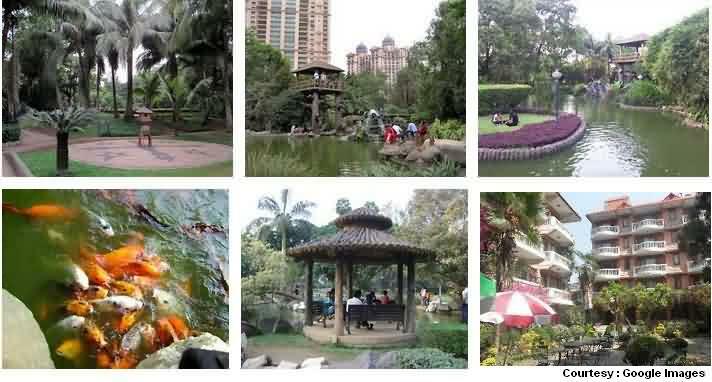 Many call it BMC Garden of Powai as it is maintained by Municipal Corporation and the Entry Gate do not have the name ‘Nirvana Park’ on board, Instead it has just written ‘Maintained by Municipal Corporation of Mumbai’. Living up to the name, ‘Nirvana’ which means a transcendent mind state with blissful feeling where a person feel extreme peaceful, calmed soul and as in Buddhism it means ‘Release from all Karma and Cycles of births’. 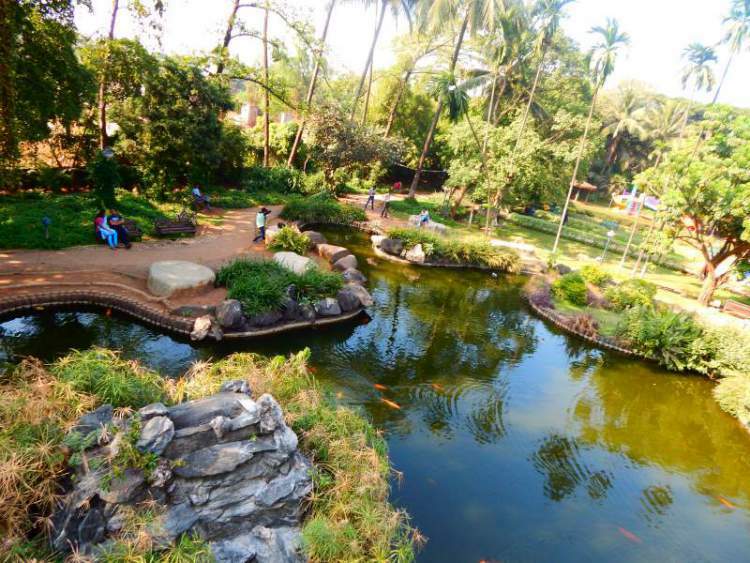 It is one of the best gardens and parks on Mumbai. Actually a blessing inside Hiranandani Powai known for classy residency with beautiful skylines with one of the best lifestyles. 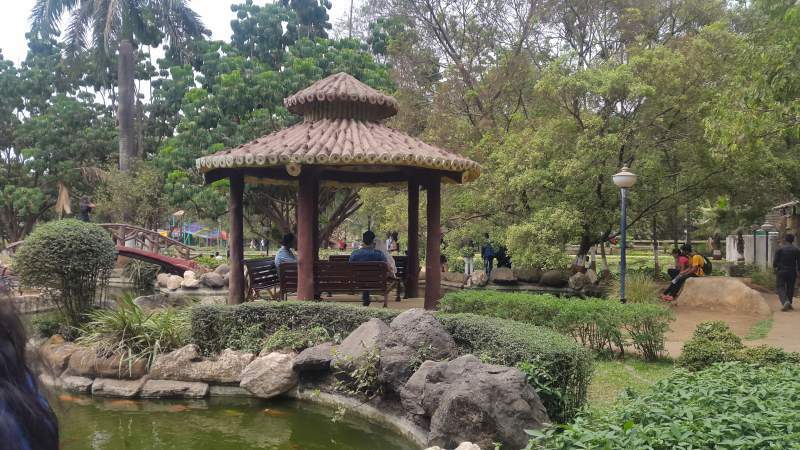 Talking about Nirvana Park attractions, The 4 acres of natures beauty is an artificially developed garden near Central Avenue which now has tall trees which gives ample shade to whole park premise. Where nature exist, blessings and footfalls persists. Biggest attraction and the reason many locals and tourist gets attracted to this park is the pleasant feeling due to greenery with water body. From tall trees to small plants and Shrubs everything is perfectly places inside Nirvana. The entry gates made up of woods and those bamboo feel around gives perfect welcome to this small green zone of Mumbai, surrounded by cityscapes of Hiranandani Powai. Re-Energize yourself just by seating calm for few minutes, relieve all stress and anxiety if you feel inside. Green grass lawns, Greenery aside walk-ways, Pond area, Wooden and Bamboo Pavilions, Machan for aerial view and those tiny flowers all around is why Nirvana attracts others. Why will it be not an ideal location for lovers too ? Many couples are seen inside park spending quality time all along the groups of families and friends around. Additionally the Iconic Digital India Lion reminds you of the world outside this relaxing park. The walkway are clean with seating available all around. From big benches to stone seating inside, the green lawn area and also around water pond, Seating arrangements are perfect for all. I particularly liked the stone seating which looks natural and blends perfectly with park ambience. The two seater rocks is perfect for 2 friends or couples and those big rocky seating is ideal for a group to chit chat and have fun. A perfect day spend in Hiranandani by outsiders and blessing for township residents for daily walking, jogging and Yoga activities. 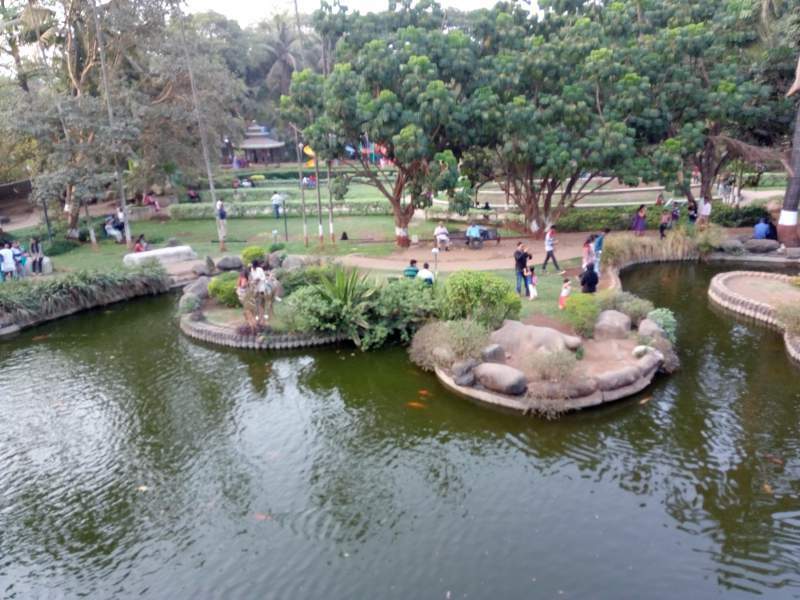 This artificial pond of Powai is neat and clean, with beautiful wooden pavilions around to relax and enjoy view during summer heat and monsoon rains. Pavilions does have few benches placed inside to seat and relax. 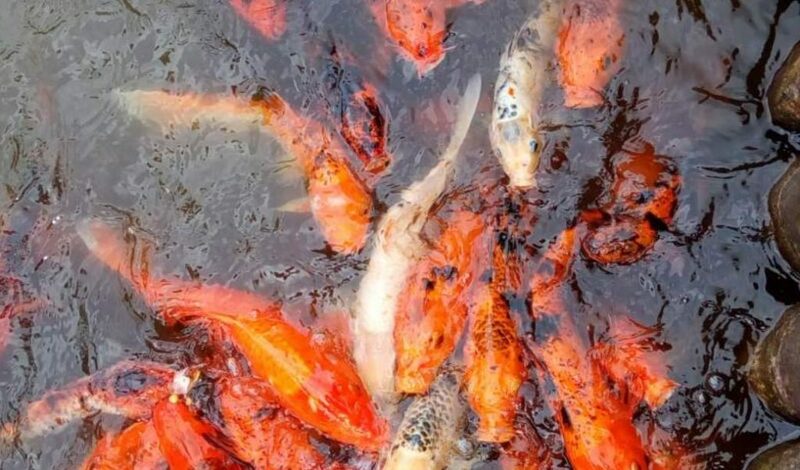 This pond has hundreds of fishes seen in bunches, Although feeding those fishes is not allowed and so is one of the reason outside food banned. Those Orange, White and Black coloured big fishes makes the pond lively. 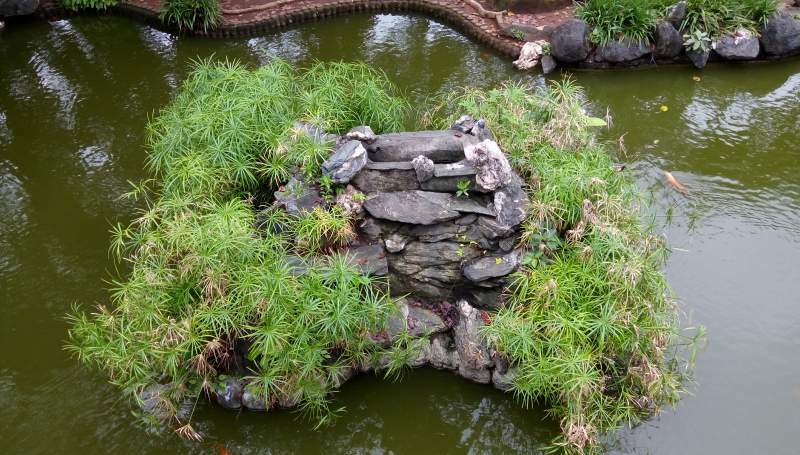 I also loved the way stones are set inside pond, few small black stones with little shrubs around and few little larger with artificial waterfall and plants. Best, the pond is clean enough and surrounded with greenery with seating arrangements. Best is the elevated machan right near the pond area for a beautiful full view of Nirvana park as seen in the photos her on this page. One of the important concern when taking kids to any garden like ‘Nirvana Park’ is the safety and hygiene conditions of garden. Kids play their heart out when they find an open space to run and green grass to stumble and roll around. One can be sure of hygiene factors as said no outside food is allowed, The green lawn has enough grass for your kids to tumble around, run and have fun. 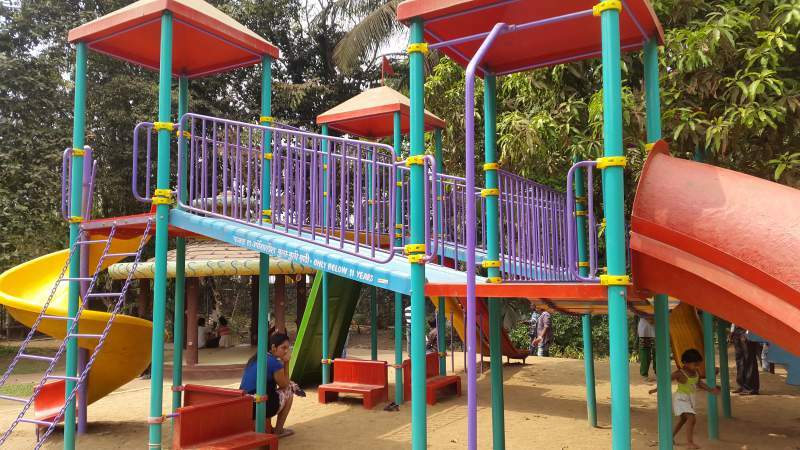 The special play children rides area inside park is perfect place for fun and physical exercise (See picture). ALERT!!! A word of caution, take care of toddlers and kids while around pond area as ponds don’t have safe fences and boundaries and a mistake here can be dangerous. Location : Nirvana Park is located opposite Powai Plaza, Central Avenue, Hiranandani Gardens, Powai – 400076. Important Note : The exact location is just 2 minutes straight from Galleria mall. So when on the main circle, comes Galleria on Left and little ahead at couple of minutes on same side is this garden. Park Timings : Open to public all 7 days from morning 6:00 Am to 10:00 Am and then 1:00 PM till 7:00 PM. The entry fee is free (Previously it was Rs.5 for adults and free for kids.) Camera fee was Rs.10 extra. Video cameras and outside food are not permitted. Nearest Railway Station to Powai : Andheri in Western Route & Ghatkopar in Central Railway Route. How to Reach by Road : From Mumbai Highway, take JVLR once you cross Goregaon and near Jogeshwari, It goes straight to Powai, Hiranandani. If you are at Ghatkopar or Central area, A Road just adjacent to RCity Mall goes to Hiranandani. Toilets available inside park, But not very clean. Their is no Parking space available inside park premise. You need to park on road side on your own risk, Although safe. See Also : You might be also interested in knowing about Maharashtra Nature Park (Sion – Dharavi Area), BPT Sagar Upvan Colaba, Hanging Garden at Malabar Hills, Priyadarshini Park at Nepeanse Road, Joggers Park at Bandra, Pramod Mahajan Garden at Dadar, National Park Borivali. Pictures Credits : Pranar Dalvi, Narendra Jadhav, Omkar Pawar, Rakesh Kumar and Dipak Vengurlekar.